Every year I set out on a quest to find my gift wrapping ensemble. For me it’s like putting an outfit together. I make sure to find the right patterns, colors, and accessories for each recipient. It’s one of my traditions that I wrap each gift with an ornament that my friends and family can keep and collect throughout the years. I like to use different types, widths, and colors of ribbon to create patterns and dimension. A good tip for using ribbon is use foundation ribbon. Those are the ribbons wrapped around the package. Tape the ends of the foundation ribbon to the bottom of the package instead of using a knot. That way they’re easy to rip off in the frantic gift opening excitement. Tie any bows or adornments onto your foundation ribbon. It works perfectly for wrapping gifts for children so they can tear right in. Top Left: A gift for my 3 year old nephew, Brian. 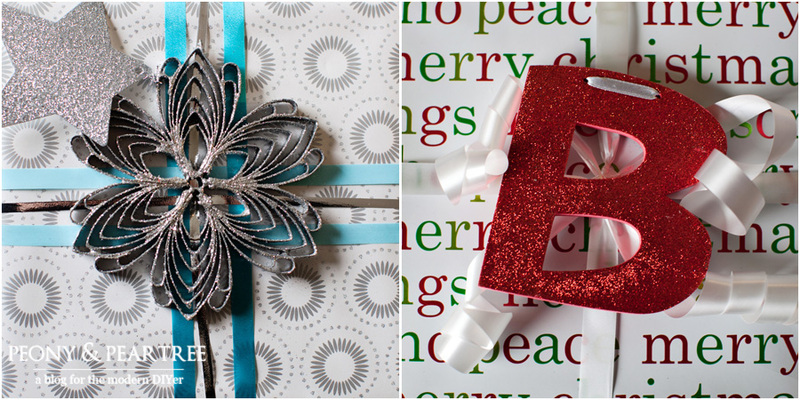 A glittered ‘B’ ornament and fun colorful paper. Big, curly, white foundation ribbon. 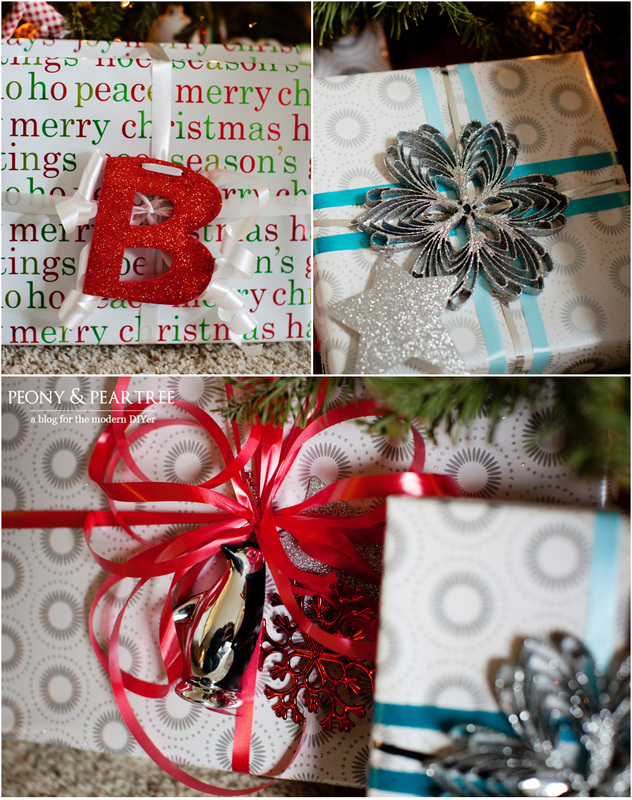 ; Top Right: For my mother in law, she loves aqua color tones and the glittery silver ornament is just her style. I used 3 colors of foundation ribbon to make a plaid pattern; Bottom: A very special gift is inside this package for my 12 year old cousin. She’s almost a teenager so I used the ‘grown up’ paper but kept it young and fun with a bright ribbon, metallic snowflake, and a penguin ornament. Love the black, white, and red with the silver geometric paper. 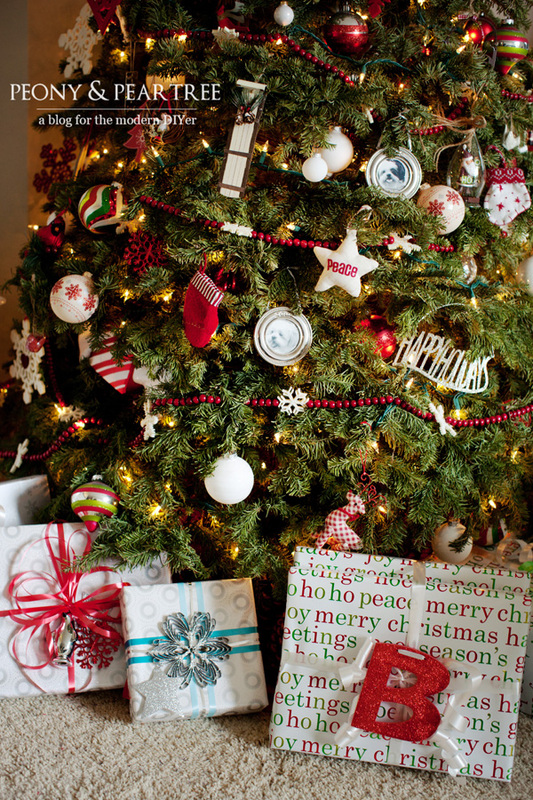 Don’t they look great under the tree? They’re a decoration all on their own! Can’t wait for my family to rip open these bad boys. Less than a week until Christmas! Get wrapping!